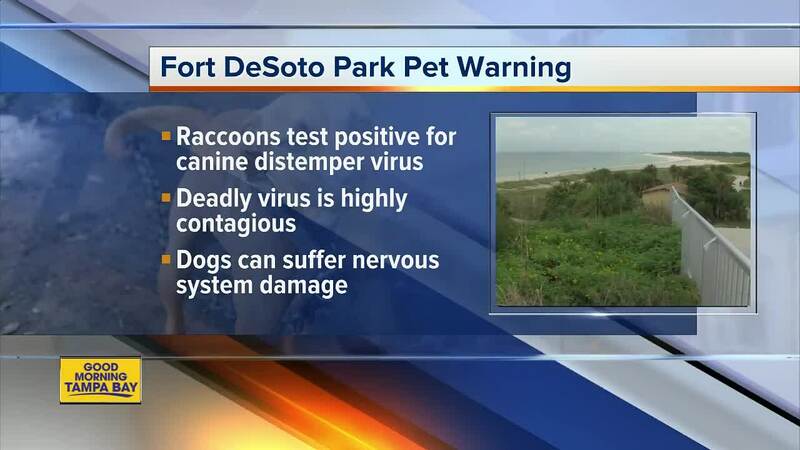 Dog owners should not take their pets to Fort DeSoto Park after raccoons test positive for canine distemper virus. PINELLAS COUNTY, Fla. — Dog owners should not bring their pets to Fort DeSoto Park right now. Pinellas County Animal Services say puppies, older dogs, ill dogs and unvaccinated dogs could be at risk for catching a highly contagious virus at the park. Authorities say two raccoons living in Fort DeSoto Park recently tested positive for canine distemper virus . The virus affects a dog's nervous, respiratory and gastrointestinal systems. It can cause canines to vomit, lose their appetite, have diarrhea and become lethargic. Owners are urged to seek immediate medical attention if their pet begins exhibiting any of the symptoms. Animal Services warns pet owners should continue to avoid Fort DeSoto Park until further tests on other raccoons are completed. Visitors to the park who encounter and animal that appears to be sick should avoid any contact and immediately call a park ranger or the Parks and Conservation Resources department at (727) 582-2100.